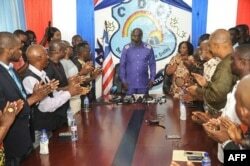 President-elect George Weah of Coalition for Democratic Change (CDC) attends a news conference at party headquarters, after the announcement of the presidential election results, in Monrovia, Liberia, Dec. 30, 2017. George Weah gave his first public address as Liberia's president-elect Saturday, telling potential investors that the nation is "open and ready for business'' and calling on Liberians who live abroad to come home. Weah won Tuesday's runoff with 61.5 percent of the vote over Vice President Joseph Boakai, who got 38.5 percent, according to final results. Liberia, a nation founded by freed American slaves, is seeing its first democratic transfer of power in more than 70 years as Nobel Peace Prize winner Ellen Johnson Sirleaf steps aside. Sirleaf, Africa's first female president, led the country's recovery after back-to-back civil wars and saw it through a deadly Ebola outbreak. "Two days ago the world saw me cry, not because I won, but for the lives of partisans who lost their lives in the struggle for change,'' Weah said after being introduced by his running mate, Vice President-elect Jewel Howard-Taylor. Weah honored Sirleaf, calling her "the Iron Lady of Africa'' and promising to "build upon the institutional gains'' her administration has made. He called on Liberians living abroad to "come home; this is a new dispensation.'' He also called for foreign investments as the flow of aid to Liberia is in decline. "To investors, we say Liberia is open and ready for business,'' he said. Former international soccer star George Weah is applauded as he arrives to speak to the press in the Liberian capital, Monrovia, on Dec, 30, 2017, the day after Liberia's elections board officially certified Weah as the winner of the nation's presidential election. Benyan Kota, who listened to Weah's speech on the radio, said he appreciated the statements about tackling corruption and about inclusion. "Whenever the world inclusion is mentioned it brings to us the feeling that a government wants to bring about protection for the underprivileged and underdeveloped,'' said Kota, president of the Christian Association of the Blind. Though hundreds sang his praises and chanted his name at the end of his speech, Weah did not mention how he intends to tackle the country's economic woes, nor did he announce specific programs to address unemployment. Expectations will be high for Weah to lift the nation from poverty and create jobs. In addition to corruption, Liberia faces problems with electricity and a health care system decimated by the Ebola outbreak. Weah's critics have said his brief experience in politics will be a challenge for the nation. Weah had run in the country's last two elections, winning the first round of the 2005 vote that eventually went to Sirleaf. He ran as the vice presidential candidate with diplomat Winston Tubman in 2011; they boycotted the runoff that granted Sirleaf her second term. As Liberia grappled with the Ebola outbreak in 2014, Weah was elected as a senator, defeating Sirleaf's son Robert for the seat.